Winning bidder Denise Garfield was one of many parents who helped raise money for a local school along with Howards following a successful fundraising event. 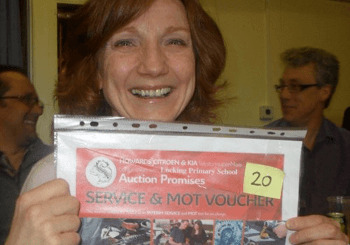 Denise bid £85 for a Howards Service and MOT at the Locking Primary School Auction of Promises family evening. All money raised will go towards a brand new outdoor play area at the Weston-Super-Mare primary school. Howards Citroen donated the voucher for a free service and MOT. Tony Lippe, Howards Franchise General Manager, who offered the prize, said: “We look forward to welcoming Denise as a new customer."